Free and reduced price lunches are available to all students who qualify and meet the eligibility guidelines. Students who qualified last year are automatically qualified this year until October 4, 2018 or until their new application is received. Applications are sent home with students on their first day of school. Meal Magic has the capability to send you an email when your child's lunch balance is low. The district "low amount" is $7.00, which is just over 2 meals. If you are interested in receiving an email, please provide your email address and the names of your students and email to me at king.shannon@willardschools.org. Breakfast is served daily in the district. We offer cereal every day as well as a hot option. Breakfast is not offered on delay days due to the late arrival time. High School students have the ability to make a la carte purchases before school on delayed start days. If your child has a food allergy, what can you do? You will need to have a physician fill out a medical statement that explains the child's allergy and what food items may be substituted. The statement must be signed by a physician. The medical statement is required by the Office of Nutrition at the Ohio Department of Education. Food allergy forms are available in every school office and by contacting Food Services at 419-935-3821. Food Services has created an account on "Remind". By joining the correct class, you can receive the daily breakfast and lunch menu via text. Students area allowed to join as well. We will send lunch menus the night before at 7:00 p.m. We will also send those early morning texts with menu changes due to weather. No more confusion about what's for lunch! To join, download the Remind app and simply enter the correct code. For elementary the code is @eda0 and for the HS/MS the code is @ef8d5. My child gets free lunch; why are they being charged $.50 for milk? Milk is free when included with a lunch; packer milk is not free. Is a la carte available to all MS/HS students, even if they receive free or reduced lunch benefits? Yes, a la carte is designed to build a full reimbursable meal, making it available to every student. Can I deposit money in my child's lunch account online? Unfortunately, no, we do not offer an online deposit option. Can I deposit money in my child's lunch account using my debit or credit card? Unfortunately no, our district does not accept debit or credit payments, only cash, check, or money order. For more information about school meals visit www.traytalk.org. Check your child's lunch balance here. If you need to know your child's ID number, please call the number below. We value your opinions and comments! Please feel free to contact us at 419-935-3821. 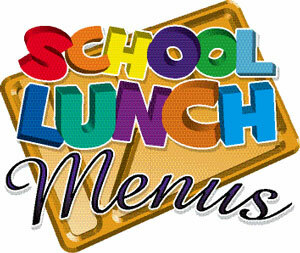 To view current lunch menus, please visit Calendars and Menus from our Homepage!